Unlike the usual taste of adobo which is salty, tangy and garlicky, this version of chicken adobo has a slightly fruity sweet taste because of the pineapple tidbits and tomatoes added. But even though this is a tasty version of chicken adobo, some people who love adobo don’t like the sweet taste and they prefer the traditional salty and garlicky version. This adobo is very easy to cook very much like the traditional adobo where you only put everything in a pot and let it simmer until the chicken is cooked. Great to serve with steamed rice for your lunch or dinner. Unlike the usual taste of adobo which is salty, tangy and garlicky, this version of chicken adobo has a slightly fruity sweet taste because of the pineapple tidbits and tomatoes added. Combine all ingredients except pineapple tidbits and tomato. Marinate for 30 minutes. Place in a skillet, cover and simmer until chicken is tender. Drain, and set sauce aside. Fry the chicken pieces in a heated skillet until brown. Add sauce again and simmer until liquid is reduced; then add tomatoes and pineapple tidbits. Serve hot. Good for 4 to 6 servings. Wow sarap naman nito kuya salamat sa recipe!!! is that tomatoes or potatoes? What do you mean those yellow thing on the picture? They are pineapples. Thanks Manny! 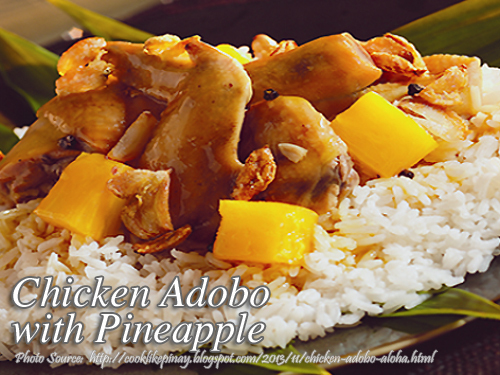 I love chicken adobo with pineapples! Glad I found your recipe! This one’s very helpful. Thank you! Hi Jed, you are welcome!